Nocona's association with wine-making goes back decades, as Italian immigrants were among early settlers to the area in the late 1800s. Nocona lies at the convergence of two beautifully enticing Texas wine trails - the Red River Wine Trail and the Cross Timbers Wine Trail. Combined, they represent a unique number of boutique Texas wineries and vineyards. 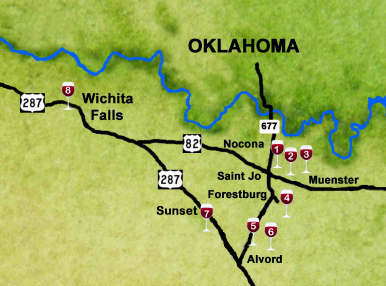 The Red River Wine Trail runs approximately 71 miles along Highway 82 in North Texas. Explore the breathtaking beauty of the Red River Valley. Be amazed by the magnificent valley vistas, beautiful green rolling hills, and wind-swept fields and prairies awash with the vibrant colors of wildflowers in spring or the rich harvest colors of autumn foliage. The Cross Timbers Wine Trail runs approximately 57 miles along Highways 287 and 199 in North Central Texas. Explore the mixture of landscapes that defines this unique region, which is made up of prairies, savannas and dense woodlands. Explore the various wineries and their unique locations in this wonderfully scenic region of North Texas.